Customer Service: Customer needs and satisfaction are our main objectives. We pride ourselves in providing the finest customer service and fastest engraved brick production time in the industry. Your specific needs will be met by our personal, honest, and sincere personnel. 100% Guaranteed: It’s easy to stand behind the quality of our laser engraved products and we are sure you’ll see why. Flexibility: We know how important your time is, so no matter the size of the job, we will give you the finest and fastest service available. Graphic Support: Let our Graphic Department assist you with designing the project that best suits your organization and represents your donors. We are also glad to help with you with your marketing needs by developing a donor brick flyer from one of our many templates to enable you to accept hard copy engraved brick and tile orders. No Contracts. No Risk. No Worries: Our aim is to make your donor brick campaign seamless, successful and stress free. Therefore, we see no reason to complicate matters with contracts or other restrictions. Online Ordering and Website Support: Bring your donors to your cause with the convenience of accepting engraved brick orders online. Let us show you how. Our online engraved brick ordering system gives your customers the convenience of ordering engraved bricks or tiles online and provides you with a powerful marketing tool to help ensure your brick fundraising campaigns are successful. References: Customer satisfaction is our top priority therefore we’re proud to connect you with present and past customers. 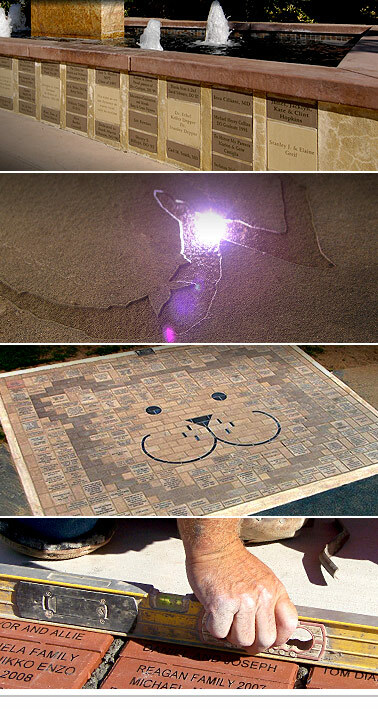 Sites Near You: Seeing is believing, we’d be happy to direct you to an Engraved Bricks installation in your area.